Take a trip on this candied locomotive to the land of sweet candy canes and gummy bears. Spin the wheel on the sugary 5 reel and earn yourself bonus rounds and some tasty free spins. The Sugar train is free and is guaranteed to satisfy all the sweet tooths out there who get that online slot craving regularly, well this is a tasty one to snack on. So, all aboard the UK online slots phenomenon. Eyecon was first founded in 1997, Brisbane, Australia. They have a considerable lengthy history stretching all the way back to the birth of online betting, which has revolutionised the way we have been gambling ever since. As a developer, they like to focus on online slot games that are straightforward and based on universally accepted standards and rules. They have over 100 online slots in their library, many of which are designed to an impressive standard, with 3D animations and graphics and immersive gameplay features. We also often run various casino promotions with this game. Sugar Train is an online slot game that will transport you back to one of your favourite childhood memories: a kid going into a sweet shop and being able to indulge in a pick ‘n’ mix bag! This online slot game will leave a sweet taste in your mouth as you spin on the 5 reels and 25 pay lines. You can start your bets from 25p up to £12.50 per spin, this wide betting range gives every player the opportunity to pick up some of their favourite sweets and enjoy a tasty treat. 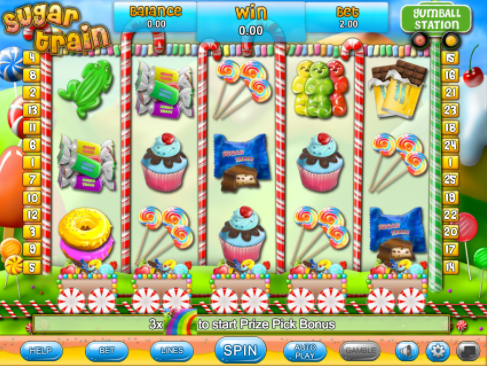 So, it’s all aboard the Sugar Train, and get ready for a sweet-filled ride with this online slot game! Exploding with colour, the game is set on a train track and tunnel made of icing sugar. The candy-striped reels are decorated with yummy goodies like Cupcakes, Sweeties, Gobstoppers, Lollipops, Doughnuts, Jelly Babies, Hearts and Frogs. The most delicious symbol is the Chocolate Bar, land 5 of these goodies and you will receive 200x times your bet! 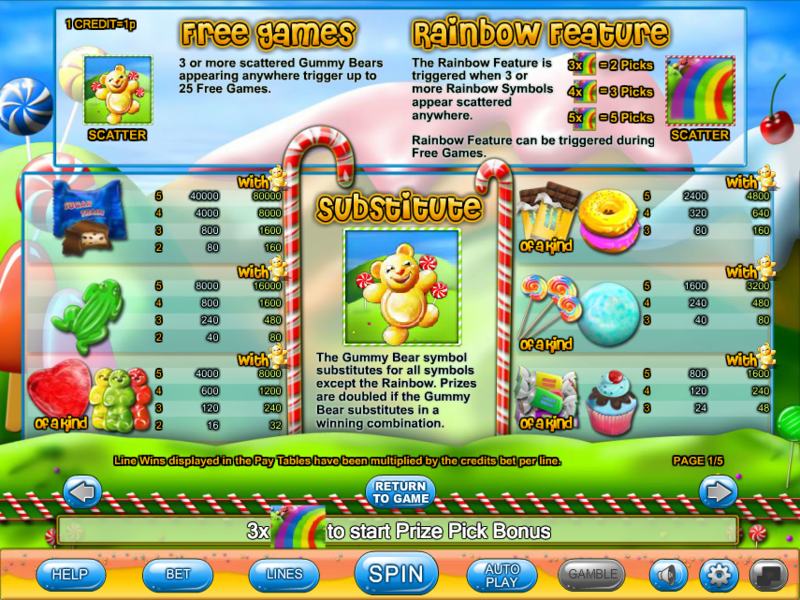 The Yellow Gummy Bear is the Wild symbol, it will replace all other symbols except the Rainbow Scatter, helping you to create those winning combinations. In addition to that, when the Wild is part of a winning line it will double your prize! The Bear also triggers one of Sugar Train’s 3 Bonus Features. To trigger the Free Games feature you will need to land 3, 4 or 5 Gummy Bears anywhere on the reels and you will be rewarded with 15, 20 or 25 Free Spins. You can retrigger these Free Spins up to 15 times, giving you the potential to win 400 free spins! The Rainbow Pick feature is activated when you land 3, 4 or 5 Rainbow Scatters on the same spin. You will receive 3, 4 or 5 selections in the Rainbow Pick bonus, each of these prize picks can award a bonus of up to 100x times your bet. Join & play! The Gumball Bonus is triggered when the red symbol on the Gumball Station sign lights up. Railway carriages will appear on the reels, and a claw will remove 5 Gumballs from those carriages. You could reveal a prize of up to 100x times your stake for each Gumball, and there is a top prize of 500x times your bet on offer!